Gift this Beautiful Roll No. 21 Gift Set to your loved ones and spread happiness. 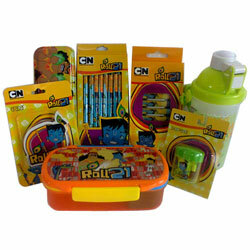 This Gift will really do wonder in the life of your kids as it has Lunch Box, Pencil Box, Sipper Bottle, Eraser, 12pcs Oil Pastel, 4 pcs Pencil Set and Sharpener.